Android and infrared come together to convert your big-screen TV into a massive tablet. 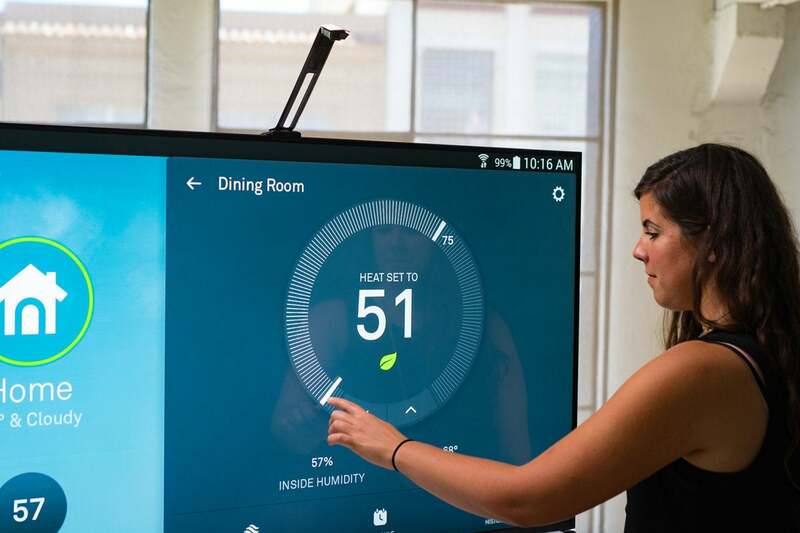 Have you ever wished that your big-screen TV operated like a touchscreen tablet? Neither have I, but my opinion evolved after spending time with the TouchJet Wave. I’m still not totally convinced of its value, especially in view of its $300 price tag, but before you blow it off, think how you could use it as a giant smart home control center, or how the kids might fingerpaint on it, or how you could use it for business presentations. Okay, so it took me a while (and some photos from TouchJet) to think of those applications: the Wave is kind of cool, so I didn’t mind the time. 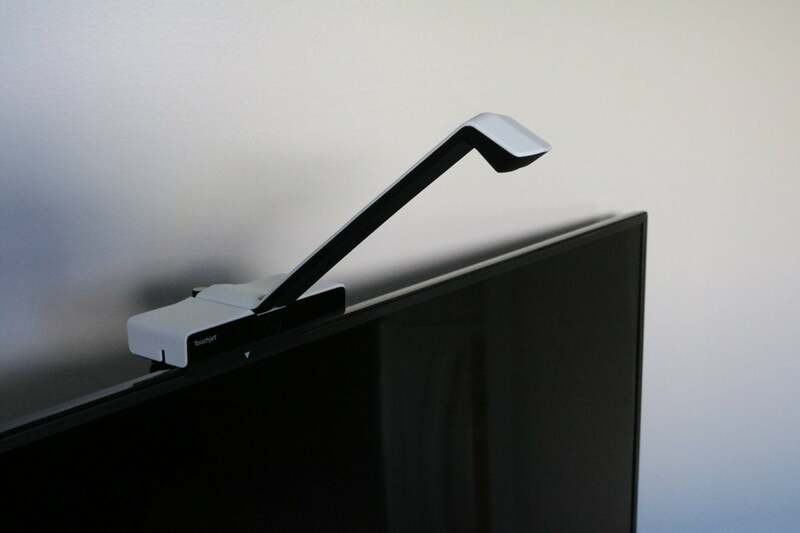 The TouchJet Wave sits quite noticeably on top of your TV, but it looks like it belongs there. It gives off sort of a portrait light/desktop lamp vibe. And the top half is white—props to TouchJet for wanting you to know it’s there. Despite it’s obvious presence, it never distracted me when using the same TV for viewing movies. I can’t guarantee that it won’t bother you. The mounting design is clever, once you understand what’s going on. Installation is not altogether intuitive and the documentation could be better. A summary and a couple of photos of how it’s all supposed to piece together, like the one below, would do wonders. This image gives you some idea of the Wave’s clever, but somewhat complicated mounting mechanism. There are basically three components involved: the Android box that sits on top of the TV; an infrared emitter, which attaches to the top of the Android box; and an infrared sensing counterpart that attaches to the TV’s bezel at the bottom of the display. The Wave’s touch function basically works by reading the interruption of the infrared beam caused by your hand or fingers. The Android box’s ports consist of an AC power jack, two USB ports (for media playback, etc. ), and an HDMI port that outputs the box’s signal to the TV. The TV’s input must be set to the HDMI input that the box is attached to before you’ll see anything. The Android box couples with a mounting device that pressure fits to the TV bezel. Additional stability if provided by an arm in the back that swings down and affixes to the back of the TV with Velcro. Assembling the parts was easy. Getting the sensor and the emitter aligned, on the other hand, proved a bit time consuming. Mild profanity was no stranger during the half-hour it took me to get the whole deal tuned correctly. There are three small LEDs on the IR sensor which tell you if you’re aligned: green for dead on, red for the emitter being tilted too far back, and yellow indicating too far forward. Once it’s physically in place, and you can see the Android interface on screen, you run a touch calibration routine and you’re done. 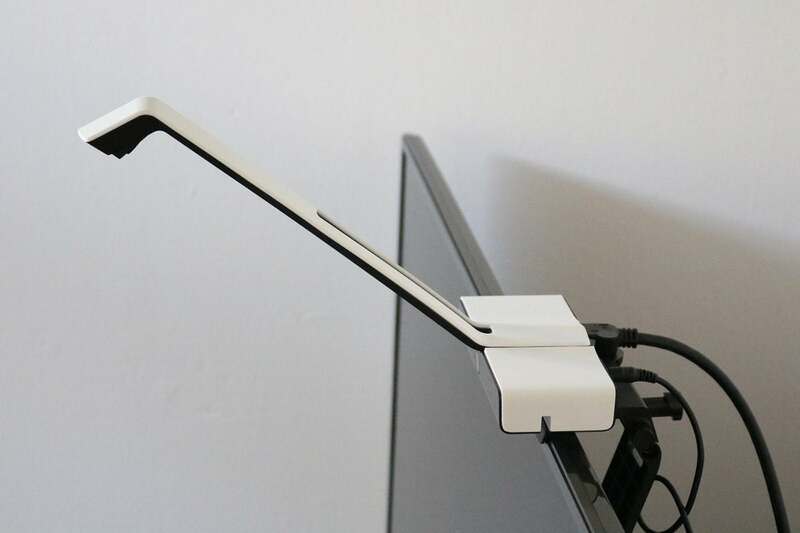 My only real caveat about the design is that the mounting arm sticks out beyond the back of the TV a fair ways, making it impossible to flush-mount the TV on the wall. 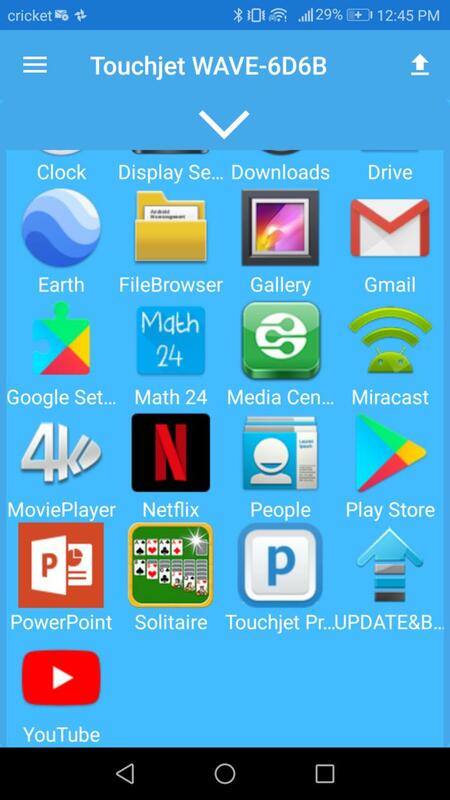 The TouchJet Wave phone app showing the Wave desktop. The Wave does all the communicating with the Android or iOS smartphone app, seen above, and the internet via Wi-Fi. For setup you can connect the phone to the Wave’s own hotspot, but when you select a Wi-Fi network, said hotspot disappears and you connect to the Wave via the selected network. Once you’ve set up and aligned the Wave, it’s time to play. I must admit, it was pretty cool to be able to do stuff on a TV via touch. That’s why touchscreens are so popular. But touchscreens have drawbacks, too. Your arms tire quickly, and there’s the whole fingerprints-all-over-the-display thing. Fingerprints or no, the TouchJet Wave is nigh on perfect for presentations. The act of controlling the presentation with the display itself conveys a certain sense of intimacy with the subject and authority over the process. Really, I think about such things. It’s a blessing, it’s a curse. But TouchJet isn’t stupid. It may not always be possible to stand next to the display, and you may simply not want to, so, of course, there’s the aforementioned Android app. It’s a very capable app that allows you to change settings, navigate the Android interface via cursor control, act like a mouse, or broadcast content to the TV via Chromecast. It’s pretty slick. Another, quite practical use for a TouchJet Wave/TV combo is as a smart home controller, as shown below: No squinting at controls with this setup! Set up a TV on the wall as a dedicated home system controoler. The rest of the deal is simply Android, with all its strengths and foibles. For TVs, you can’t help but think streaming via YouTube, etc. There are a lot of apps for the environment, so you can basically do whatever you can with an Android device. I regularly recommend that anyone with a high-quality CCFL-backlit LCD TV keep it until they put the color back in all LCD TVs. The LED backlighting in use today provides a very washed-out image unless you can spend serious cash to acquire one of the best models. You can add smart features to your CCFL TV using a DVD, Blu-ray, or Ultra HD Blu-ray player. But the Wave’s combination of full-on Android smarts and touch makes it even better and more fun. During testing, I was thinking the Wave would come in at about $150. I don’t always ask up front. The $299 price tag surprised me a bit and takes the Wave from a possible Christmas curiosity purchase to an expenditure worthy of more contemplation. Price aside, the Wave is clever, it works well, and there are some serious uses for it. It’s also fun, so if it strikes your imagination, have at it. TouchJet has come up with a very clever way to add both Android smarts and touch capabilities to any TV or display. It's useful for everything from presentations to keeping the kids occupied, but at $300 it's not a stocking stuffer.